Managed Bean is a regular Java Bean class registered with JSF. In other words, Managed Beans is a java bean managed by JSF framework. The managed bean contains the getter and setter methods, business logic or even a backing bean (a bean contains all the HTML form value). Managed beans works as Model for UI component. 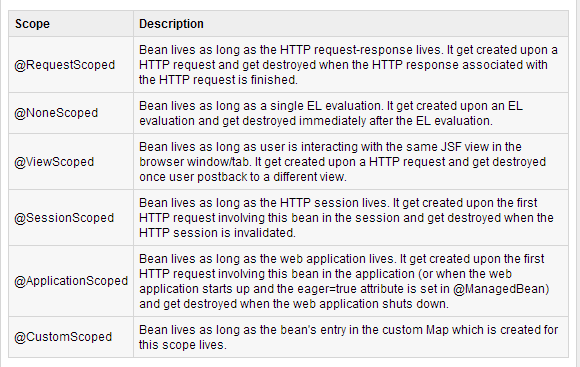 Managed Bean can be accessed from JSF page. 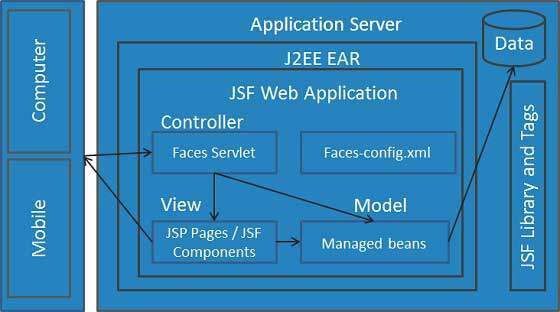 In JSF 1.2,a managed bean had to register it in JSF configuration file such as faces-config.xml. From JSF 2.0 onwards, Managed beans can be easily registered using annotations. This approach keeps beans and there registration at one place and it becomes easier to manage. @ManagedBean marks a bean to be a managed bean with the name specified in name attribute. If the name attribute is not specified, then the managed bean name will default to class name portion of the fully qualified class name. In our case it would be helloWorld. Another important attribute is eager. If eager=”true” then managed bean is created before it is requested for the first time otherwise “lazy” initialization is used in which bean will be created only when it is requested. Scope annotations set the scope into which the managed bean will be placed. If scope is not specified then bean will default to request scope. Each scope is briefly discussed below. JSF is a simple static Dependency Injection(DI) framework.Using @ManagedProperty annotation a managed bean’s property can be injected in another managed bean. A JavaServer Faces page is represented by a tree of UI components, called a view. During the lifecycle, the JavaServer Faces implementation must build the view while considering state saved from a previous submission of the page. When the client submits a page, the JavaServer Faces implementation performs several tasks, such as validating the data input of components in the view and converting input data to types specified on the server side. The JavaServer Faces implementation performs all these tasks as a series of steps in the JavaServer Faces request–response life cycle. This is one of the trickiest parts of JSF: The JSF framework controller uses the view ID (typically JSP name) to look up the components for the current view. If the view isn’t available, the JSF controller creates a new one. If the view already exists, the JSF controller uses it. The view contains all the GUI components and there is a great deal of state management by JSF to track the status of the view – typically using HTML hidden fields. The components validate the new values coming from the request against the application’s validation rules. Any validation errors will abort the request–handling process and skip to rendering the response with validation and conversion error messages. Note: The difference between this phase and Apply Request Values – that phase moves values from client–side HTML form controls to server–side UI components; while in this phase the information moves from the UI components to the backing beans. The UI components save their state – not just their values, but other attributes having to do with the presentation itself. This can happen server–side, but by default state is written into the HTML as hidden input fields and thus returns to the JSF implementation with the next request. 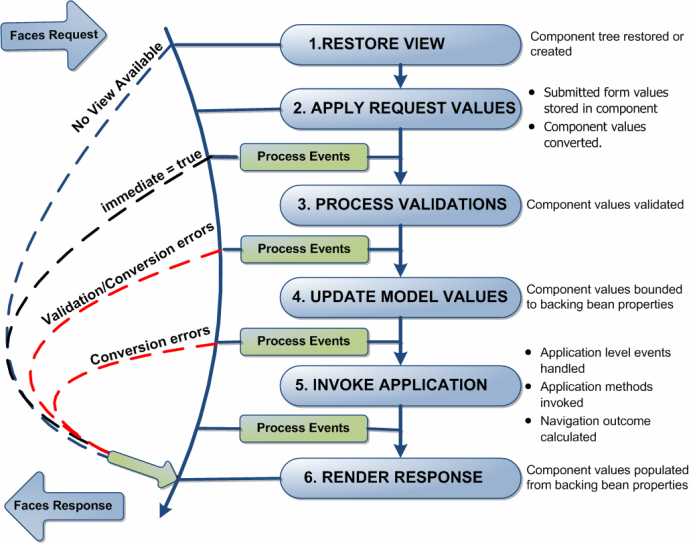 If the request is a postback and errors were encountered during the apply request values phase, process validations phase, or update model values phase, the original page is rendered during this phase. If the pages contain message ormessages tags, any queued error messages are displayed on the page. There are controllers which can be used to perform user actions.UI can be created by web page authors and the business logic can be utilized by managed beans. JSF provides several mechanisms for rendering an individual component. It is upto the web page designer to pick the desired representation, and the application developer doesn’t need to know which mechanism was used to render a JSF UI component. JSF technology is a framework for developing, building server side User Interface Components and using them in a web application.JSF technology is based on the Model View Controller (MVC) architecture for separating logic from presentation. Web Designers have to concentrate only on view layer rather than model and controller layer. Developers can change the code for model and typically need not to change view layer.Controllers are used to process user actions. In this process layer model and views may be changed. A JSF application primarily contains two types of components — both are easy to use and conforming to the POJO philosophy. JSF is a component based MVC framework which is built on top of the Servlet API and providescomponents in flavor of taglibs which can be used in JSP or any other Java based view technology such as Facelets.